1795: William Elijah Green to Dr. John Green, Jr.
1798: John Richard, Jr. to Benjamin Harrison, Jr.
1820: John Pryor McNeill to John Rutherford, Jr.
1829: John Turner to John Turner, Jr.
1830: George Washington Blake to Elihu Blake, Jr.
1831: Calvin Cunningham, Jr. to Charles Cunningham, Jr.
1836: Peter Wainwright to Peter Wainwright, Jr.
1841: David Johnston to James Johnston, Jr.
1844: Eveline (Johnson) Calkin to George Clymer, M.D. 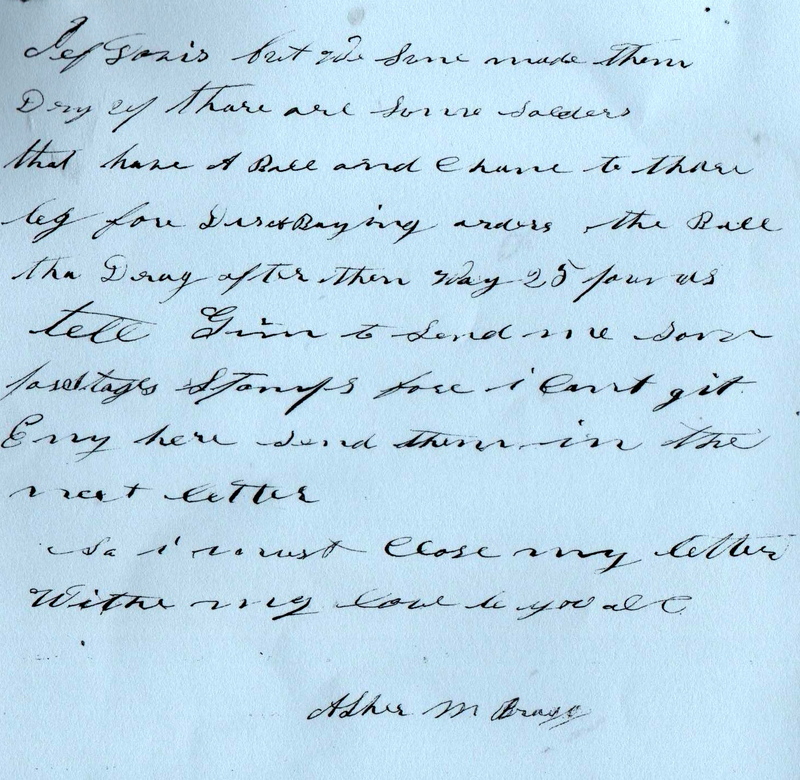 1847: Margaret Louisa Bowie to Walter Bowie, Jr.
1847: Rev. Charles Witmer to Jacob Roses, Jr.
1852: George Patch & Co. to Flint, Peabody & Co.
1852: Rodney Putnam Odall, Jr. to Rodney Putnam Odall, Sr. 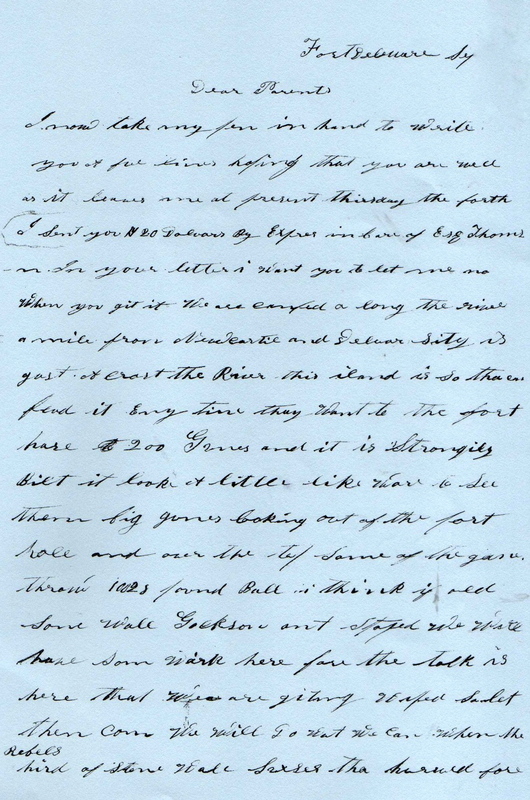 This letter was written by Sergeant Asher Minor Bragg (1840-1867) of Pittston, Luzerne County, Pennsylvania. He wrote the letter to his parents, James Bragg (1814-Aft1880) and Margaret Moore (1817-Aft1880), both emigrants from England. Asher’s father was a saddle and harness-maker as was his older brother Charles. Asher worked as a machinist in 1860 but appears to have also taken up the harness-maker’s trade prior to the start of the Civil War. Asher’s parents were still living in 1880; they were enumerated at their resident on Exeter Street in West Pittstown, Luzerne County, Pennsylvania, where his father still labored, at age 66, as a harness-maker. Margaret (Moore) Bragg was the daughter of Duke Malcolm Moore (b. 1779) and Elizabeth Atkins. 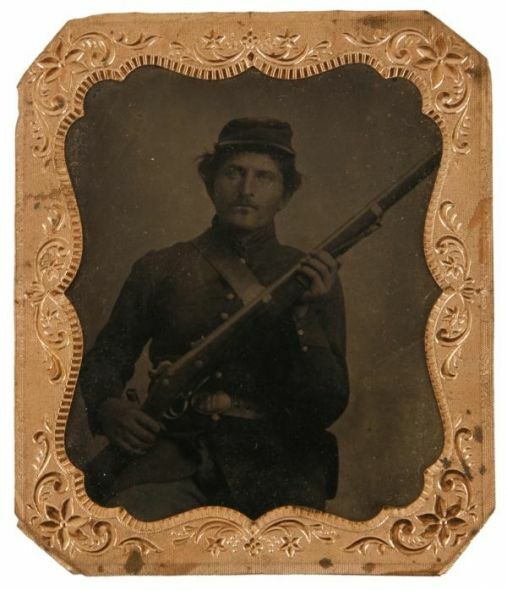 From his service record and the pension application filed by his mother, we know that Asher Bragg enlisted as a Sergeant on 19 August 1862 and left Pittston as a volunteer in “Schooley’s Battery” which was afterward assigned to 112th Regiment, 2nd Pennsylvania Artillery. Bragg was taken with chronic diarrhea before Petersburg in 1864 and was sick a year before he got his discharge in June 1865 at the close of the war. He remained bedridden and never recovered from the chronic diarrhea contracted while in the service and he died in Pittston in February 1867. Note: Asher Bragg’s middle name is spelled “Minor” here because records in his pension application spell it that way. There is some chance that it was actually “Miner”, however, as he was likely named after Asher Miner (1778-1841), a newspaper publisher in Pennsylvania. I now take my pen in hand to write you a few lines hoping that you are well as it leaves me at present, Thursday the fourth. I sent you $20 dollars by Express in care of Esq. Thompson. In your letters, I want you to let me know when you get it. We are camped along the river a mile from Newcastle and Delaware City is just across the river. This island is so _____ fend it any time they want to. The fort has 200 guns and it is strongly built. It looks a little like war to see them big guns looking out of the fort wall and over the top. Some of the guns throw 128 pound balls. I think if old Stonewall Jackson ain’t stopped, we will have some work here for the talk is here that we are getting whipped.¹ So let them come. We will do what we can when the rebel herd of Stonewall lasses that hurrahed for Jeff Davis but we sure made them dry up. There are some soldiers that have a ball and chain to their leg for disobeying orders. The ball that drags after them weighs 25 pounds. Tell Jim to send me some postage stamps for I can’t get any here. Send them in the next letter. ¹ Bragg is no doubt referring to the failure of the Union army to turn back Lee’s army at the Second Battle of Antietam in late August 1862. On the very day that Bragg wrote this letter, Thomas “Stonewall” Jackson was crossing the Potomac River at White’s Ford and invading Maryland.